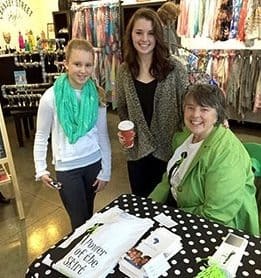 On March 6, local boutique Carnaby Street Style in Kent, Ohio, hosted a Girls’ Night Out, entitled “Power of the Skirt” in order to raise funds for African Sky’s Women’s Literacy Project. The event was an intimate affair of over twenty ladies who attended in order to learn more about African Sky. Helen McKee, boutique owner, along with the assistance of her granddaughters Jacquelyn Brown and Rachel Prior, hosted the event to promote awareness of African Sky’s involvement in women’s education in Mali.